Ferdinand de Saussure is often regarded as the founding father of semiotics, which is the meaning of signs and sign systems. His theory was that all signs are made up of a signifier and a signified and a sign can no exist without these two components. Also according to Ferdinand de Saussure the relationship between the signifier and signified are arbitrary which means there is no real connection between them, it’s what the culture makes of them. The signifier is a physical object, word or image and the signified is the meaning or concept associated with the signifier. For example if you are driving and come across a stop sign (Signifier) you stop, the reason you stop is because you think if you don’t stop you could cause an accident (signified). 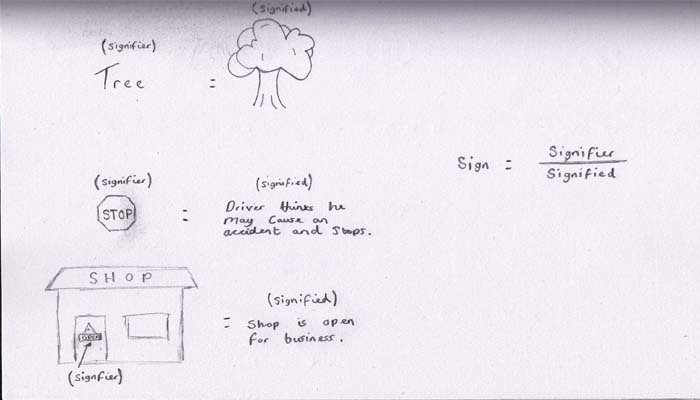 Another example could be that when some sees an open sign (Signifier) on a shop, it means that the shop is open for business and you are allowed to enter (Signified). The colour red is a prime example of how a culture can interpret things differently, in western culture the colour red indicates danger, passion and love, in Chinese culture it indicates good fortune and joy. Below are some examples I quickly drew up. Icon: An icon is a pattern that physically resembles what it stands for. Index: An index can be defined by smell, taste, sight etc to indicate what is going on. Symbol: A symbol is a mark that represents some kind of information.